Eric Finzi was born and raised in New York City. His art career started at age ten after his art teacher accused him of cheating on a book cover project. She believed he must have stenciled a copy of the Egyptian mummy he drew free hand. To convince her, he created a new cover in a different size. His parents decided then to get him private lessons in oil painting. When he turned 13, he received a scholarship to a life painting class at Pratt Institute in Brooklyn. By the age of 15 he was studying with Harvey Dinnerstein at the Arts Student League in New York City. Finzi then received another scholarship to Greenwich House School of Pottery in New York. At age 16, Finzi taught ceramics at Cornwall Summer Workshop in Connecticut and started college in the fall at the University of Pennsylvania where he studied biology and fine arts. Finzi began taking evening classes at the Art Students League under the tutelage of Vincent Malta and Raphael Soyer. After receiving his PhD on yeast mitochondrial protein synthesis in the fall, he enrolled full-time in the Art Students League with artist Knox Martin. Finzi then moved to Montpellier, France to paint. He moved back to America to finish his medical studies and began a full time position as a Laboratory Fellow at the National Cancer Institute. Shortly thereafter, he started a weekend sculpture class at the Corcoran in Washington, DC. Finzi’s art career got its next boost when he was kicked out of the research laboratory at the National Cancer Institute for spending too much of his free time making art. He left the lab to start his residency at Johns Hopkins Hospital in the Dermatology department. After completing his residency in 1991, he began pursuing a mixture of painting, sculpture, and dermatologic surgery. 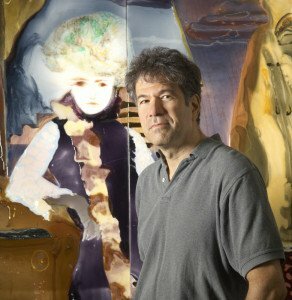 In 2003, Finzi began exhibiting his unique epoxy resin paintings in New York. Since then he has had solo U.S. exhibitions in New York City, Chicago, Miami, Los Angeles, San Francisco, Phoenix, Baltimore, Washington, DC, and internationally in Ferrara, Italy, and Cologne, Germany. For more information, visit the Solo/Group Exhibitions section of this site.